the first thing that attracted me to this brand is the fact it’s completely natural. I’m currently 4 months pregnant and conscious of what I put on my skin whilst actively seeking ways to prevent stretch marks and nourish my drier skin. 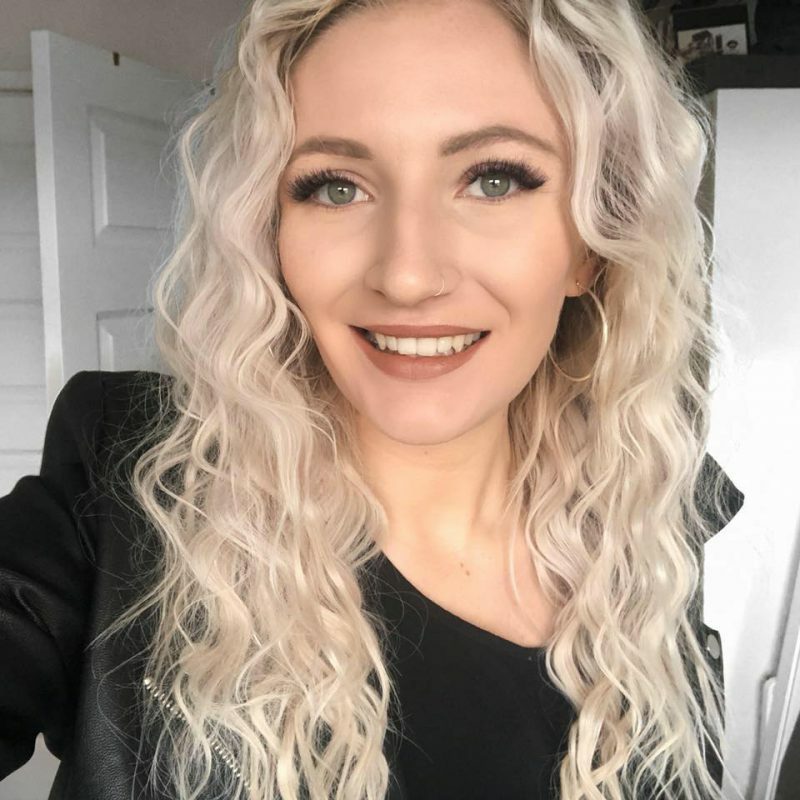 There are several other scrub-type products available but be careful of those with microbeads as they’re terrible for the environment and generally something we should all actively seeking to avoid when it comes to skincare and cosmetic products. 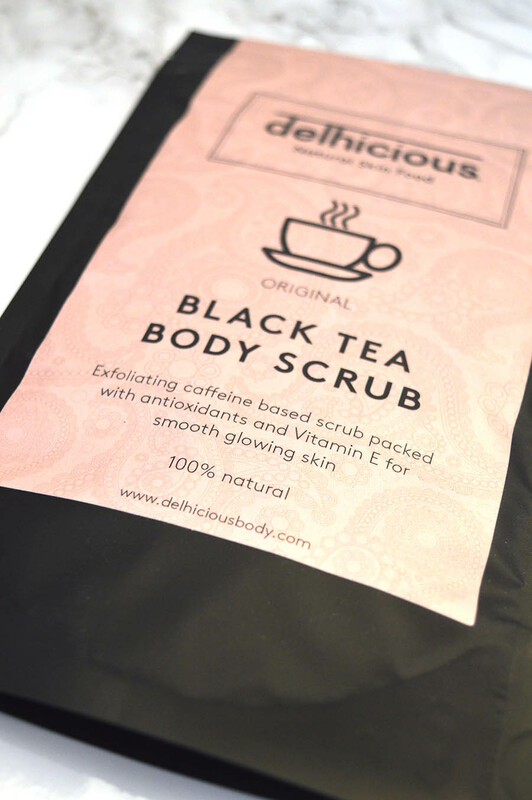 This is, in fact, the UK’s first black tea scrub and I couldn’t wait to try it out for myself. Like any type of scrub, these things can get messy so I made sure I began with a towel beneath me, close to the shower where I could proceed to wash it off. It also smelt amazing, like super uplifting and energising. The texture was to be expected too; grainy but the brown sugar in the mix complimented the texture to make it feel like it really worked on the skin. Be careful not to use too hard motions when applying as it can feel quite abrasive if you’re not too careful. When applying, I apply a small amount for each section of my body and used circular motions to work it into my skin gently with the palm of my hand. It actually felt so nice and relaxing when applying. All in all, I’m in love with this product and I’m delighted there is finally an alternative to coffee scrubs out there! 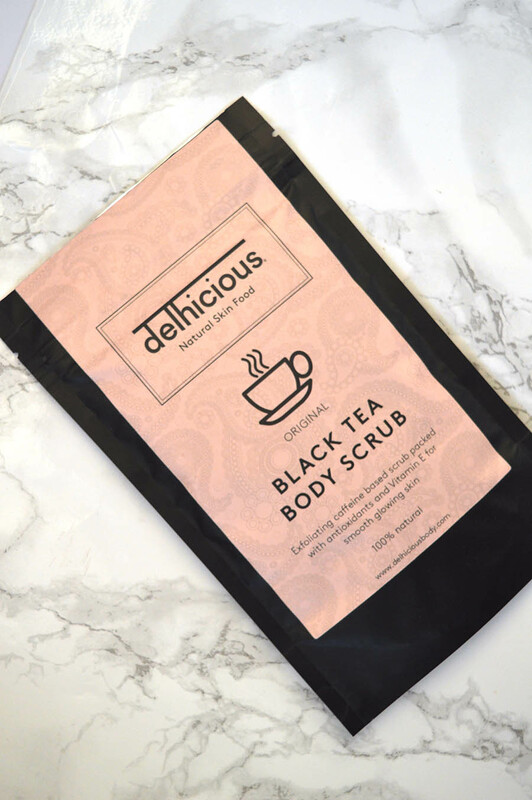 I love looking after my body as much as possible and I know I’ve found a new favourite in this Delhicious black tea body scrub! Not only did it make my skin feel incredibly smooth, it left a gorgeous glow that I’m obsessed with! I’d definitely repurchase this and would recommend to anyone looking for a new scrub to try out. What’s your favourite skincare item? Let me know. *this product was sent to me in exchange for an honest review, all opinions are my own, see my full disclaimer for more details.